272 pages | 16 B/W Illus. Understanding Cultural Policy provides a practical, comprehensive introduction to thinking about how and why governments intervene in the arts and culture. 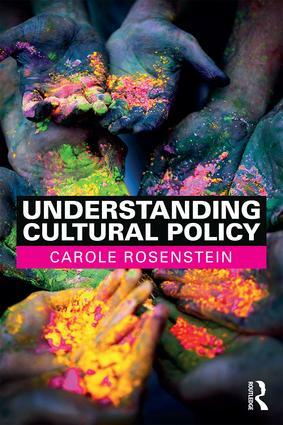 Cultural policy expert Carole Rosenstein examines the field through comparative, historical, and administrative lenses, while engaging directly with the issues and tensions that plague policy-makers across the world, including issues of censorship, culture-led development, cultural measurement, and globalization. Several of the textbook’s chapters end with a ‘policy lab’ designed to help students tie theory and concepts to real world, practical applications. This book will prove a new and valuable resource for all students of cultural policy, cultural administration, and arts management. Chapter 1 – What is Cultural Policy? Carole Rosenstein is an associate professor of arts management at George Mason University, USA. She has directed research projects for the Urban Institute, the National Endowment for the Arts, and the Institute for Museum and Library Services. Her scholarly work has been published in leading international cultural policy journals including The International Journal of Cultural Policy; The Journal of Arts Management, Law and Society; and Cultural Trends.